Our latest book to have fun with is Dog's Colorful Day by Emma Dodd. 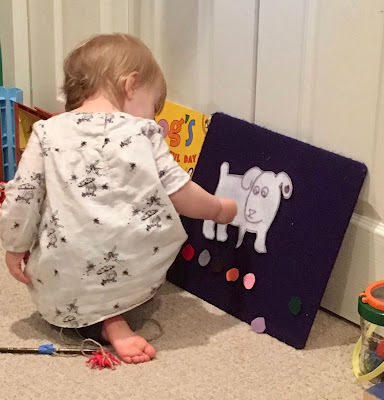 You can find the felt board pattern at Making Learning Fun. We read the book several times before I introduced the felt board pieces. I initially used pompoms for the coloured dots. and for matching to the pictures. But they rolled off the felt board when it was standing up. So I made coloured felt circles for her to use. They worked great, regardless of where she placed them on Dog. A bonus was that they worked well for matching to the pompoms. Her favourite part in the book was the yellow pollen falling off the bee. I think it is because we were seeing so many bees in our raspberry bushes at the time.